Graphics add a vivid, eye catching highlight to printed output. Graphics can include custom logos, images, words or symbols. 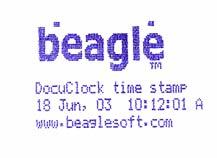 The DocuClock dot-matrix print head will then render the image when the slip is printed. You can combine images with standard output (like time stamps). Create or convert artwork into a bitmap image file format. Chose the line you want the image to appear in the DocuClock page setup. Select the 'Image' type. Enter or browse for the bitmap image file to use. Close-up of combination image and printed output. That's it. DocuClock will print the image each time the slip is printed. You can print up to 5 image files at one time. Images can be inserted above, below or between lines of text. Monochrome, non-compressed bitmap files work best. Keep file size under 2k bytes, if possible. The printer will store smaller images and speed the printing process the next time the slip is printed. Images with strong thick lines work best. Maximum single image size is approximately 1 inch high by 2.5 inches wide.